With tremendous help from the our supporters we've received the green light from our Seed & Spark crowdfunding campaign! We now have completion funds. Saving For The Day will be completed this fall and released in 2017. Thank you so much to all our supporters! Saving For The Day was featured in the Missoula Independent's Green Room series. Article is written by Erika Fredrickson. We had a great turnout at the Clark Fork Market in Missoula. Thanks to everyone who stopped by! 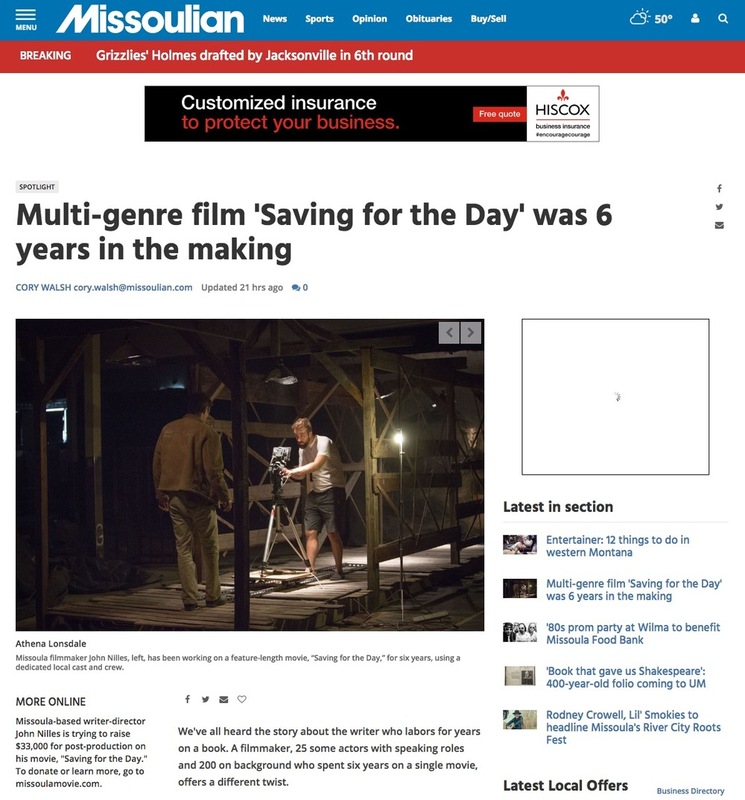 Corey Walsh of the Missoulian wrote a great article about the production of Saving For The Day. Read it HERE! Seed & Spark is like Kickstarter only they have a curated list that specializes in independent films. We are honored to have been chosen. Go to www.MissoulaMovie.com to watch our our director attempt to ride a horse and get into a knife fight. We're offering Social Media shout-outs, DVDs/Blurays, T-shirts, Posters, HD digital downloads, Tickets to the Missoula premiere and afterparty, roles as zombies, roles and zombie slayers, Associate Producer credits, and Executive Producer credits. You support is greatly appreciated! Please spread the word (MissoulaMovie.com)! Production on Saving For The Day has wrapped! It's been a long road and we can't wait to get in the editing room. Our first poster has arrived! Here's our "Indiana Joe" poster by the extremely talented, Dwayne Harris. Check out his website HERE. We've begun the final leg of production. We've got some very ambitious sequence to shoot. Ready?...DRAW!! !